A ‘polar vortex’ is leading to record low temperatures. Sunlight streams through the windows of a building which caught on fire in Plattsmouth, Nebraska. IT HAS BEEN decades since parts of the Midwest experienced a deep freeze like the one expected to arrive tomorrow, with potential record-low temperatures heightening fears of frostbite and hypothermia. This “polar vortex,” as one meteorologist calls it, is caused by a counterclockwise-rotating pool of cold, dense air. The frigid air, piled up at the North Pole, will be pushed down to the US, funneling it as far south as the Gulf Coast. Ryan Maue, of Tallahassee, Florida, a meteorologist for Weather Bell, said records will likely be broken during the short yet forceful deep freeze – a perfect combination of the jet stream, cold surface temperatures and the polar vortex – that will begin on Sunday and extend into early next week. All the ingredients are there for a near-record or historic cold outbreak. If you’re under 40 (years old), you’ve not seen this stuff before. Before the polar plunge, today marked the day Earth is the closest it gets to the sun each year. The planet orbits the sun in an oval and on average is about 93 million miles away. But every January, Earth is at perihelion, and on Saturday, it was only 91.4 million miles from the sun. But that proximity doesn’t affect the planet’s temperatures, and the predictions are startling: 25 below zero in Fargo, ND, minus 31 in International Falls, Minnesota, and 15 below in Indianapolis and Chicago. At those temperatures, exposed skin can get frostbitten in minutes and hypothermia can quickly set in as wind chills may reach 50, 60 or even 70 below zero. Even wind chills of 25 below zero can do serious damage, according to National Weather Service meteorologist Scott Truett in St Louis. The cold will sweep through parts of New England, too, where residents are digging out from a snowstorm. And fresh powder is expected in parts of the central Midwest and South starting tonight — up to a foot in eastern Missouri, 6 to 8 inches in central Illinois, 8 or more inches in western Kentucky and a half-foot to a foot in southwestern Michigan. Snow will reduce the sun’s heating effect, so nighttime lows will plummet because of strong northwest winds that will deliver the Arctic blast, Maue said. There’s no warming effect from the Gulf to counteract the cold air, he said. Even places accustomed to mild and warmer winters will be affected early next week, including Atlanta where Tuesday’s high is expected to hover in the mid-20s. States are trying to get ahead of the storm, with Minnesota calling off school Monday for the entire state – the first such closing in 17 years – as well as the Wisconsin cities of Milwaukee and Madison. Though this cold spell will last just a few days, it likely will freeze over the Great Lakes and other bodies of water, meaning frigid temperatures probably won’t go away for the rest of the winter, Maue said. He also noted that it’s relatively uncommon to have such frigid air blanket so much of the US, maybe once a decade or every couple of decades. But so far, this winter is proving to be a cold one. 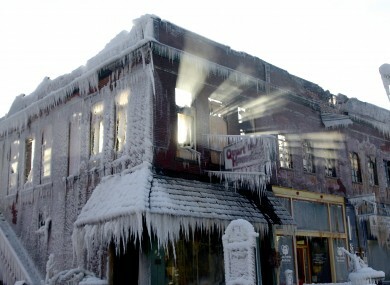 Email “PICS: US Midwest braces itself for record freeze”. Feedback on “PICS: US Midwest braces itself for record freeze”.